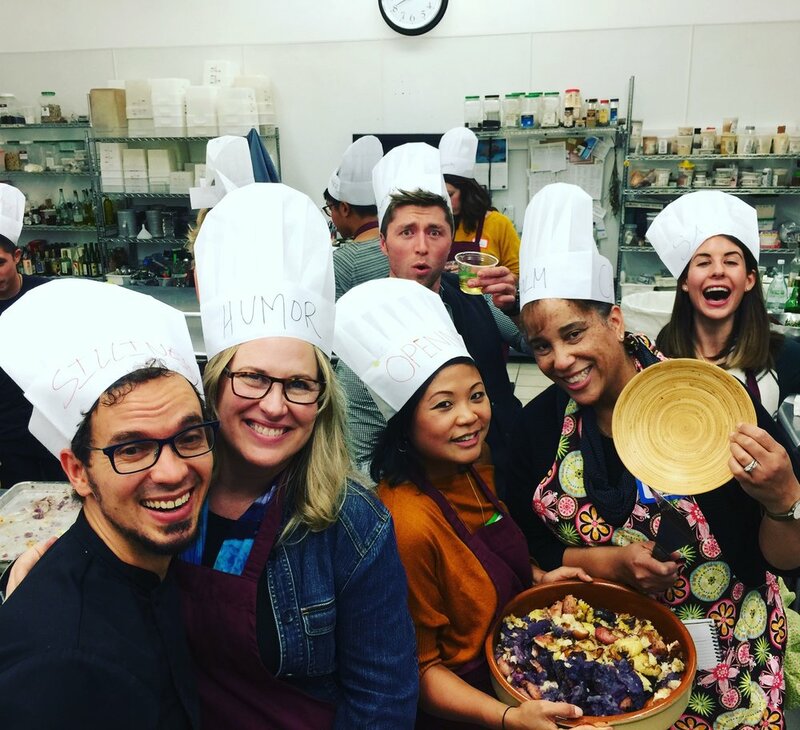 Sacred Kitchen is a collaborative dining celebration that brings people together to create extraordinary food and experience heartfelt connections. Sacred Kitchen combines the warmth of a family supper with the ancient ritual of breaking bread together. Each course is infused with a spicy blend of humor, vulnerability, and powerful facilitation creating a space where all are feel welcomed, deeply appreciated, and invited to show up authentically. These are priceless moments and they remind us of who we are and bring us close to the people we love in the best way. What is universal about our events is that there is always a moment of mindfulness when people are invited to connect in with themselves and each other. It’s not always easy to stand up and share vulnerably about the impact someone has had on your life. Chef Jesse has spent years crafting his gift for speaking from the heart into a format that’s accessible to everyone. Through the medium of food and the ancient ritual of toasting--Jesse has the ability to gracefully coax rooms into those meaningful and heartfelt spaces that are deeply nourishing--but can be uncomfortable to get to. week long retreats for hundreds where all meals are handled by the Sacred Kitchen Team. We offer completely unique coaching and sacred kitchen community celebration event packages. Check out our blog entries for Andy's Farewell and Morgan and Peter's Celebration to learn more. We’ll ask questions about menu design and service style, budget and facilitation needs and offer you a proposal based on that conversation. If you are ready to talk to us, you can fill out a consultation form here. Why do we need Sacred Kitchen? As a culture we have rituals and ceremonies to celebrate graduations and weddings but there are other critical "threshold" moments when we are left wanting for a deeper sense of community, connection, and support. There are no standard events for a career changes, divorces, retirements, or moves away from our established communities. Often, even our traditional celebrations like birthdays and baby showers leave us wanting for the authentic connection we most crave. Sacred Kitchen creates public and private spaces for just the kind of community connection we yearn for. Food is our most basic means of connecting with ourselves, our communities, and the planet. Like nothing else, food evokes our sense of belonging and Home. Sacred Kitchen address our yearning to drop in and slow down, to connect deeply, and our desire to be seen by others for the best that is in us.